To buy and keep, currently half price, less than £2 a movie. 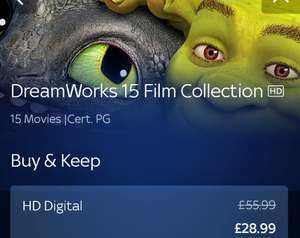 15 hilarious family adventures from the top drawer of acclaimed animation studio DreamWorks' best feature films, including the Shrek, Madagascar and Kung Fu Panda series. The Croods, Puss in boots & Turbo. 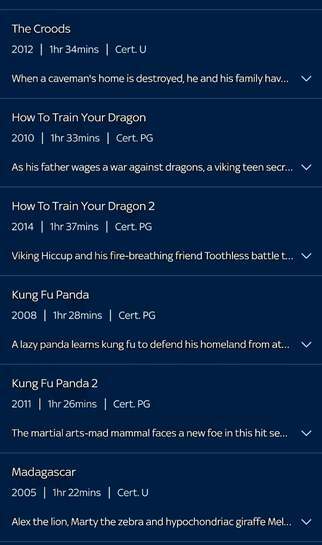 I have bought lots of movies from sky over the years, once you’re out of contract they aren’t available from the sky box anymore (apparently still available on the app, but that’s no good for kids who want to watch on the tv). I won’t be buying any more. I have bought lots of movies from sky over the years, once you’re out of c …I have bought lots of movies from sky over the years, once you’re out of contract they aren’t available from the sky box anymore (apparently still available on the app, but that’s no good for kids who want to watch on the tv). I won’t be buying any more. Haven't you written this same complaint almost word for word on other Sky Store threads? You can still view them on the TV via the NOW stick or you can chromecast it from the app. Not really a big problem. Haven't you written this same complaint almost word for word on other Sky …Haven't you written this same complaint almost word for word on other Sky Store threads? You can still view them on the TV via the NOW stick or you can chromecast it from the app. Not really a big problem. I have written a similar thing on another thread. I don’t have a chromecast or nowtv, as I have two smart TVs. I bought all kids films - my kids can navigate Sky to put a movie on, but wouldn’t be able to change to tv settings to another input. I wish someone had told me sooner before I spent money on a dozen films.